Durable Roppe vinyl fillet strips and tub molding won't crack, chip, or fade. Available in a variety of colors these fillet strips and tub moldings are the perfect finishing touch for your tub, counters, or shelves. 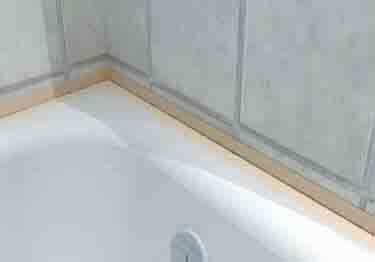 Tub Molding available in 1" and 1-1/2"
Must the upper portion of this product go over the wall tile or may it be placed behind the tile so that the only part that's visible is the flat part that sits on the tub? Thank you for your question. We appreciate your feedback and glad to hear how easy our Vinyl Strip and Tub Molding was to use. Finish for bathtubs, counters, & shelves. Self adhesive backing for easy install. 5 ft strips available in 1" & 1-1/2" heights.